What was Israel's major complaint against Solomon? He taxed them too heavily. 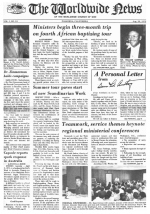 Ministers begin three-month trip on fourth African baptizing tour - Dr. Zimmerman holds campaigns - Summer tour paves start of new Scandinavian Work - A Personal Letter from Garner Ted Armstrong - Teamwork, service themes keynote regional ministerial conferences - The Official Grapevine - Bible study begins for inmates behind Leavenworth Prison walls - Santa Rosa member leaves for new post in Ecuador - Spanish-speaking brethren to meet in Oaxtepec - Texas outdoors setting for oldest site - Local Church News Wrap-up - A MISSING FACTOR IN INFANT NUTRITION - Diggers' tour of northern Israel covers historical sites of Bible - Imperial Schools SEP Loch Lomond - New computer complex a symbol of progress - Access to computer helps departments in many ways - Wheel design reshapes offices - Computer benefits subscribers in improving circulation service - Move to new complex aids mail reading department - Plain Truth circulation from Bricket Wood.